"He said, 'From my rotting body flowers shall grow, and I am in them and that is eternity.' Isn't that beautiful?" When I first read this book, I knew nothing of Stalin's Purge. Therefore, the story just remained a story to me. Not a week after I finished, we did a complex lesson of the Purge in my Current Events class, and every thought I had ever had about this book changed. I read it again, and this time my heart throbbed for the characters more than they ever had the first time I read this. Trust me, the first time I read the book, I loved it. I just thought it was a sad story, though—but there's something about knowing that the events of a story have actually happened to some people that makes you just stop and think. It's really inspiring, really. I used this book for a report I had to do on the Purge as well. Lina takes you through her stories of art and of writing, describing her time in those dirty train cars and those humiliating moments in the showers and learning of the people she'll be living with. Love blossoms, hope sprouts, hatred abounds. This story can be as gripping as The Diary of Anne Frank and it can be as heart-wrenching as The Book Thief. This mysterious era in history has finally been brought to light in the YA world because of this novel. How could the world let something like this happen? How could these people stay silent after it was all over? How could they survive in such conditions? Between Shades of Gray is amazing. In its own way it answers these questions, unflinching yet gentle. There are no easy descriptions. You read what you read, you see what you see. You see the world as it was, no sugarcoating involved. You receive flashbacks throughout Lina's travels that give insight on her life before being sent on this purge. These are nice for showing how the characters have developed. You see how each character changes for the better and for the worse, and you watch each character come to terms with flaws and strengths they all possess. People become friends. People become enemies. Enemies to friends, friends to enemies; confusion to clarity and vice versa. 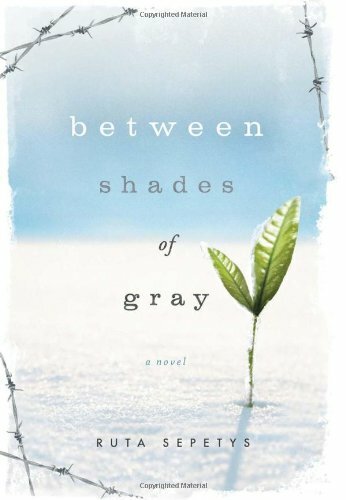 Between Shades of Gray is a story of strife, conflict, survival, love, and just about any emotion you can come up with. It covers resolutions, questions, and ends on a note that leaves you pining for more but knowing that it has ended perfectly. I tried to do this without spoilers, which led to it being such a short review...apologies. (: Anyway, that's all the reviews for the day. Finally, ready to cross them off my to-do list. Amazing book! Amazing characters! Amazing everything!